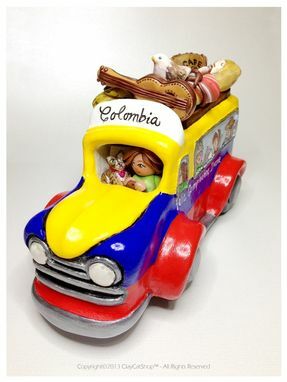 "These super colorful & rustic buses were once commonly used in Colombia for rural transportation, they carried people, livestock and merchandise. However they are now known as a symbol of the Colombian culture and little by little they are being replaced by newer, faster and safer methods of transportation." An custom made art sculpture, skillfully sculpted out of polymer clay with love and extra hugs! ;) inside wire structure, painted with acrylics, varnished for durability and gloss. This particular Chiva measured around 10" x 5" x 7 x 6.5"
****This is a sample of one we did for a client. If you are interested in one, get in touch with us. Price will vary depending on the size and complexity of the piece. **** We can always work with your budget.